Who invented Google? Google was invented by the computer scientists and internet entrepreneurs Larry Page and Sergey Brin. When was Google invented? Google was invented in 1998, during the Technology and Information period of invention. The invention of Google originated in America and is considered a standout achievement to the field of Communications and Information. Definition of Google: Google is defined as the name of an American multi-national technology company that specializes in Internet-related services and products including software, and hardware, online advertising technologies, search engine technologies and cloud computing. Fact 1: Who invented Google? Google was invented by Larry Page and Sergey Brin in 1998 during the Technology and Information era of inventions and was a ground breaking development in the advancements to the area of Communications and Information. Fact 2: Who invented Google? Larry Page and Sergey Brin were motivated to such a degree that they were destined to become acclaimed as the inventors of Google. Fact 3: Who invented Google? The invention of Internet occurred over a period of years starting with ARPANET but it really took off in 1973 when American computer scientists Vinton Cerf and Robert E. Kahn who developed the Transmission Control Protocol (TCP) and the Internet Protocol (IP). Fact 4: Who invented Google? In 1991 Tim Berners-Lee invented the World Wide Web and changed the world. People had access to instant information via their Computer which provided them with a massive library in their living room. Fact 5: Who invented Google? Web search engines were developed to enable people to quickly locate Web pages that had been loaded on the World Wide Web that met their search criteria, or keywords. Software systems called spiders, crawlers or robots were designed to catalog the Web pages automatically and compile a database of pages found. When people entered search terms, the search engine scanned the database and returned a list of Web pages where the keywords were found. Fact 6: Who invented Google? Each search engine were developed with different searching algorithms for its spiders, crawlers or robots, so that Web pages collected in search engine databases were different from each other. Fact 7: Who invented Google? Prior to the invention of Google in 1998, there were many other web search engines such as Altavista (1994), Infoseek (1994), Allweb (1993), Lycos (1994), Ask Jeeves (1997) and MSN (1998). The early web directories were Yahoo! (1994), LookSmart (1995) and Inktomi (1996). Fact 8: Who invented Google? The problem with many of the first web search engines was that results of searches were often inaccurate and frequently gave irrelevant results. This is the reason why Larry Page and Sergey Brin decided to start their own project to create a different kind of search engine. Fact 9: Who invented Google? 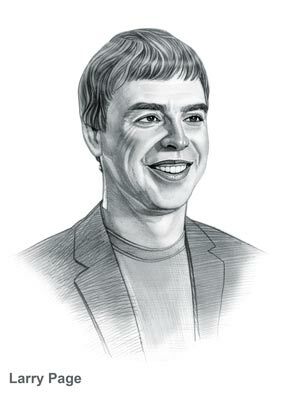 Larry Page was born on March 26, 1973 in Ann Arbor, Michigan and Sergey Brin was born on August 21, 1973 in Moscow, Russia and moved to the United States with his family in 1979. Fact 10: Who invented Google? In 1995 Sergey Brin and Larry Page meet at Stamford University, in Palo Alto, California, to study for their Phd's and collaborated on a research project on the Stanford Digital Library Project (SDLP). The aim of the project was to develop technologies to create "a single, integrated and universal digital library". Fact 11: Who invented Google? The invention of Google began when Larry Page and Sergey Brin began investigating how sites linked back to other web pages and quickly realized that helping people find pages with more incoming, credible links would be a better way to search the Internet. Using this idea they developed their first search engine in 1996 called 'BackRub', which used back links in their design. Fact 12: Who invented Google? Using the information gathered about back links Larry Page and Sergey Brin developed their PageRank algorithm and realized that the data could be used to build a new, superior web search engine with far more accurate and relevant results. Students at Stanford began to use their 'BackRub' search engine, which was on the Stanford website, and Larry Page and Sergey Brin knew that by using a scoring approach they were on to a winning, unique and hopefully, lucrative idea. Fact 12: Who invented Google? The pair left Stanford and started work in a sublet garage. They named their search engine "Google" after the mathematical term "Googol," which is a a number that is equal to 1 followed by 100 zeros and expressed as 10100 which they felt reflected their mission to organize the massive amount of information available on the World Wide Web. Fact 13: Who invented Google? Larry Page and Sergey Brin raised $1 million from family, friends and other investors and Google Inc. opened for business on September 7, 1998 in Menlo Park, California and later moved to Bayshore Drive in nearby Mountain View. Fact 14: Who invented Google? The Google search engine was faster than other search engines showing limited graphics and used "PageRank" to provide people with fast, relevant results based on the popularity and other attributes of website pages. People loved Google and, by 2000, 18 million people were searching Google every day. Fact 15: Who invented Google? In 2000 Foreign language Versions of Google.com were available and in the same year Google Adwords were launched based on keyword related contextual advertising. Fact 16: Who invented Google? In 2001, due to pressure from investors in Silicon Valley, Eric Schmidt joined Google as its first chairman and later its CEO. Sergey Brin became president of technology and Larry Page became president of products. Fact 17: Who invented Google? Google was a massive success and in 2004 Sergey Brin and Larry Page were recognized for advancements in communications and honored with the Marconi Prize. Fact 19: Who invented Google? In 2007 Sergey Brin married Anne Wojcicki in the Bahamas and Larry Page married Lucinda Southworth on Necker Island in the Caribbean. Fact 20: Who invented Google? Google expanded still further offering YouTube, Android, Chrome browser and Maps navigation. In 2009 Forbes magazine named Sergey Brin and Larry Page as the fifth most powerful people in the world due to the dominant market position of Google. We are now seeing ultra cool Google Driverless Cars. Who invented Google? Now you know that Larry Page and Sergey Brin were the names of the people who invented Google! We hope that the facts in this article have provided the answers to all of your questions about the Invention of Google and its famous inventors.